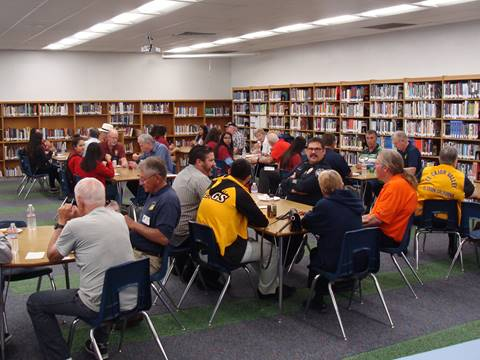 Guests: We were the guests today at our El Cajon Valley High School LEO Club Meeting. 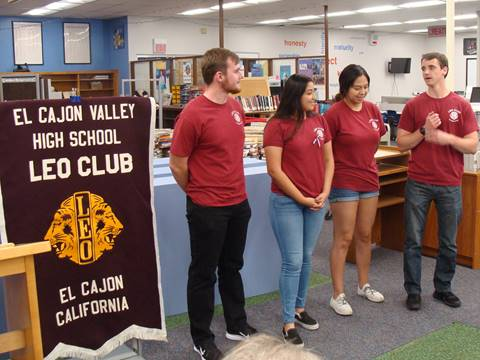 Each of the LEO Club officers introduced themselves with a brief background bio. Also Doug Davis is the new Faculty LEO Advisor. Lion LEO Advisor Mike Carleton called LEO District Chair PDG Scott Leslie and LEO Vanessa Nunez to the podium. At the MD4 Convention in February LEO Vanessa was chosen as the MD4 LEO of the Year for her extensive service to her club and the community and as Secretary of the LEO District of 4L6. The trophy presented to LEO Vanessa was stunning. ..Lion Capt Rob reported the Westboro Church protest on campus this AM fizzled and all was peaceful. Students were not subjected the rhetoric and were able to enter campus at other locations. Thanks to the EC PD for handling what could have been a major situation. 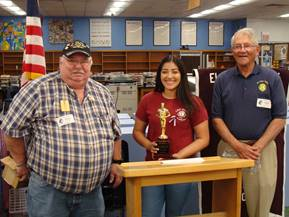 .LEO Vanessa gave a synopsis of what the LEO Club has been up to this year including blood drives, an Easter event coming up, their help with our pancake breakfast and with our Xmas Baskets. In fact they have another blook drive on April 1st on campus. .School Principal Km Patterson said a few nice words and complimented Lion LEO Advisor Mike Carleton for being ‘the man’ who helped keep the club together upon the demise of last years Faculty LEO Advisor. .Treas Mike T says there are still 3 openings for the Lions Tribute at City of Hope this Sunday – contact him if you’re interested in attending. JUNE 29th – ECVH LC Installation of Officers. 80 spots filled now have a Waiting List. TODAY’S HAPPY DOLLARS WERE DONATED TO OUR LEO Club for their Treasury and “we done good” – cash and pink slips totaling $555.